A YEAR OF JUBILEE REVIEWS: MacLarry and The Stinky Cheese Battle Preorder DVD Sale! MacLarry and The Stinky Cheese Battle Preorder DVD Sale! 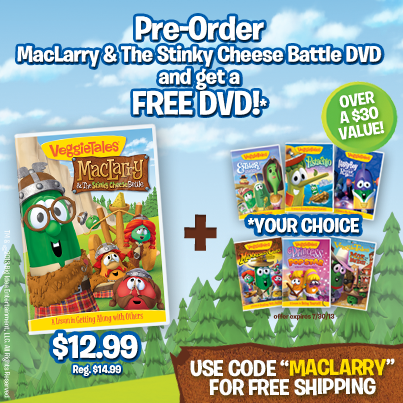 When you pre-order MacLarry & the Stinky Cheese Battle DVD you will get a choose a free DVD (there are 6 DVDs to choose from). This is a great deal! It's over a $30 value! Plus you can get free shipping when you use the code MacLarry! Veggie Tales are outstanding! I have been watching them for over 10 years and even my teens will watch! We love them as a family for sure!